ALLEGRA BOVERMAN/Staff photo. Gloucester Daily Times. 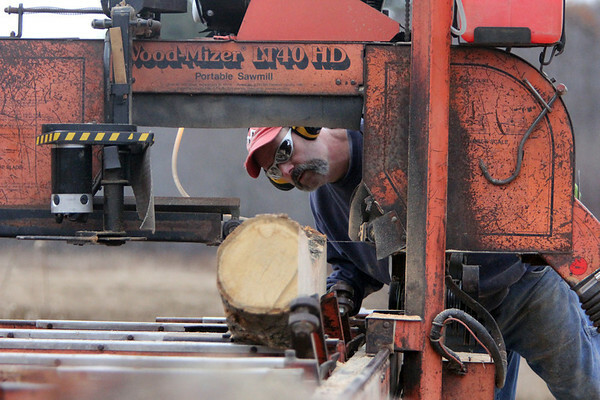 Essex: On his day off, Eric Heitz of Hamilton, an Essex Department of Public Works employee, cuts logs into lumber with his portable saw mill at Duncan Tree property in Essex on Thursday afternoon. He utilizes discarded trees that the company doesn't need and mills them for his own use with his lathe and for other woodworking projects. He was cutting up a chestnut tree on Thursday whose seeds came from Italy, was planted and grew in Essex, and then cut down recently because it rotted.